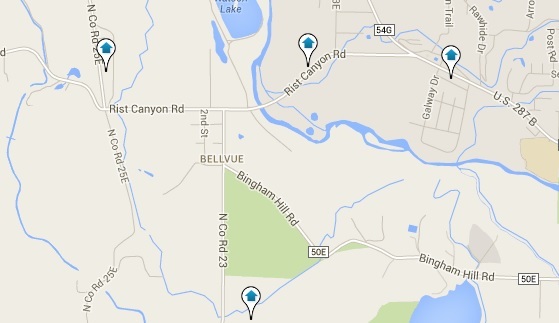 Search all Bellvue real estate listings with our easy to use Bellvue MLS/IDX property search. Receive daily email alerts of new listings for sale as they hit the market as well as updates on price changes. Located just a few miles north of Fort Collins, Bellvue is a small agricultural community in the foothills of the Rocky Mountains. What Bellvue lacks in restaurants and shops it makes up for in recreational activities. The area is known for its outdoor activities including hiking as well as kayaking and fishing on the Cache la Poudre river. Many of the homes in Bellvue are located on large lots over one acre in size. The population is approximately 2,100. Click here to view ratings of Bellvue, CO schools on GreatSchools.org.